The Friends of the Flange : Guest Post: What are Volunteers Worth? Guest Post: What are Volunteers Worth? Jerry bring his professional skills as a volunteer gets in there where the dirt is. We were talking about this the other day and it has been something I have thought about often over the years.We just don't pay our tourist railroad volunteers enough! Seriously! There isn't a group out there that wouldn't benefit from an over abundance of interest and cheap labor, and I mean really cheap. 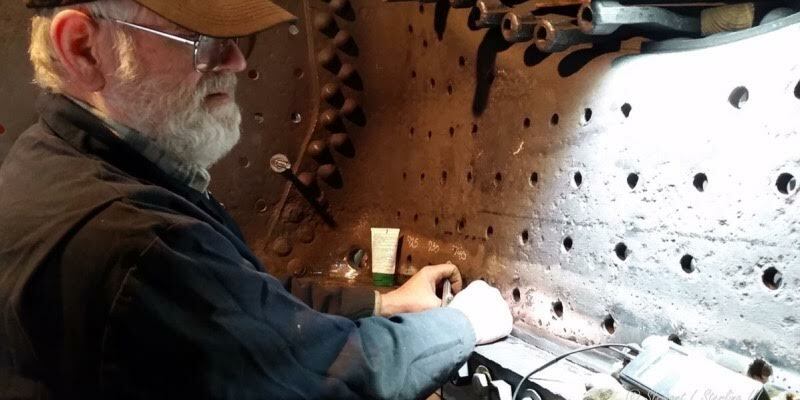 I have watch as folks will drive for miles, hang out, drop hints, almost beg to get a chance to work on a locomotive, or support a restoration, be involved in the world of railway preservation. Often their enthusiasm is maybe a little misguided and grandiose in ways they don't really know how to focus. But it is there! I can't fault them anyway. I know how they feel. Let me elaborate, cause it wasn't always in the best of ways. Many of us have had to almost force our way into assisting in restorations of many kinds. I remember getting involved in one in which we where thought of as 100% crazy. It was a small locomotive, and in the big picture merely a spec, but it had history for our community. Its working history spanned three centuries. It had suffered the effects of floods, one hundred years of freezing and thawing, and was tucked away .....okay....moved out of the way, many times to make room for something else. Restoring it was pretty much a lost cause. As the group got this crazy dream, they really had no idea how they were going to make it happen or what it was going to cost. The group persevered, though, and kept at it even under some pretty intense conditions. They worked in bitterest of cold, the wettest rainy seasons, and even when the bugs where more of a meal than something you could swat away. It took ten very long and questionable years. They started with no funding, nothing except the goal of having a small engine run around a park. Every member of that crew was a volunteer. They didn't make a dime in that whole time. Why did they do it? Who is crazy enough to work for nothing under such crummy conditions with absolutely no guarantee that they were ever going to see a single breath of steam or a flanged wheel turn on rail. But one thing keep it going...they believed they could. They wanted it to happen, and they were willing to work for it. Many frozen fingers, bug bits and skinned knuckles later, she actually steamed! On her 100th birthday, even! Now, there was something even more significant in this in my mind. We started out as just a few old men with a dream, but we had some youths that tagged along. And as the engine matured in the restoration, so did they. They learned some valuable skills that helped them in choosing careers that have benefited them today. They had something that they felt passionately about and cared that it was completed. Oh, in the beginning, it was a concern among the older members they would be to young to understand or operate our little gem....but it took long enough and they knew her inside and out just like us! And the rail preservation gained some valuable assets. They had found something that they felt passionately about, and cared that it was completed. In the beginning, it was a concern among the older members they were too young to understand or operate our little gem, but the restoration took long enough that by the time it was done, they knew her inside and out just like us! The rail preservation gained some valuable assets. Let me contrast this positive experience to another experience that I hope is not too common. This was a long time ago. I was working on the other end of the country for a period of time and when I had some free time, I would seek out steam railroads where I would hope they would let me help. I provided credentials and experience. Most encouraged and allowed me to help, but there was one organization that left a bad taste in my mouth and inspired me to write this article. I showed up, and the crew working on the locomotive saw that I was willing, able and wanted to get dirty. I shared with them my experiences and offered to do what I could to help. There was no objection from the crew. They were rebuilding the smoke box, and any help was welcome. Over the course of the weekend, we busted a gut and got a lot of work done. The working crew was grateful and I was happy. I was a grunt, tool chaser, grinder, heavy lifter and anything they asked for. We accomplished a lot. I drove back to the city I was working, about 4 hours away, and slept wonderfully. Monday morning, back in my work office, I get a call from this organization, and the manager of the operation was reading me the riot act, upset that I had not gone through the proper channels....him, to be a volunteer. It didn't matter my credentials, skill, or experience. "Nobody touched the locomotive unless he okayed it." What had been something I wanted to,help with now was something I really didn't care if succeeded or not. So much for the volunteer payment. It had little to do with legality ( that wasn't the issue at the time), it had nothing to do with the environment or the security ( again it, was before the current uneasiness in society)....it was an attitude. It was the un-gratefulness for the free offering I gave. Sometime we are our own worst enemies. In the aftermath of that, I have always asked myself, while working with other volunteers....do we encourage, mentor, promote a reason for volunteers to 'want' to spend time with us again? Not every organization is set up to be able to have youth as part of their crew. And there are also older folks who would gladly contribute their skills and labor to the steam/preservation movement. They just don't know how to get involved, or realize that the opportunity is there in the first place. I know, we all know, that not everyone has the ability to walk in the door with skills that we can put to task the moment they show up. It takes time to understand the dynamics of the railroad industry or a shop environment. Throw in the complexity of our machines, which is becoming more foreign to our youth and honestly...it can seem like we are asking for trouble. But I don’t think so. I happen to think that those of us in the restoration of railroads, be we seasoned volunteers or the few paid individuals, have a great opportunity to build the rank and file. We have to look at and consider what we have before us. I have some friends on Facebook, and they are comparably young, but they are out there crewing a couple major main line steam operations. Absolutely awesome! They had to start some where and I recently meet one of the men guiding their efforts. He understands it and I believe embraces the fact that we have their strength at our disposal if we mentor it correctly. Mentoring. That crazy word that means we are going to have to put some effort into patients, understanding and empathy. But I know it is worth it. We have to be smart of course, and consider what truly can be their strengths. Their 'payment' must match the effort that is put forth. After a short period, it won't be the carrot out there they are after, they will understand deep down just what we all know. The project they are apart of, the chunk of metal, iron, wood and steel, is now part of us. We want it to happen. It stirs the soul and becomes way more than just materials. There is no payment on earth that can match what stirs our soul. That is what drives us to the long dirty hours, the sacrifice so great, the skinned knuckles, the cold endured, the patients needed to bring water to boil within a barrel of rivets and flues, and rattle those nuts n bolts down a flanged rails. Let's embrace those folks, young and old, patiently guide them along the right of way. Give them a reason to stick around, learn a few things, and make a new friend or two along the line. The views and opinions presented in this guest post do not necessarily reflect those of Friends of the Flange.